Forever Young: Not for the faint of heart, amp up the glam factor with this fiery tango red. - No Boundaries: This juicy passionate plum is ripe for the picking. Bold and intoxicating, it's anything but ordinary. - Lacy Not Racy: A twist on a classic, this velvety vintage burgundy walks the line between naughty and nice. - Tomboy No More: Transform into lady sophisticate with this red currant truffle luxe enough to satisfy any lady's craving. " 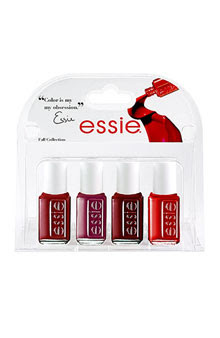 Nordstrom Exclusive Essiie Fall 2008 Mini 4 Pack available for preorder. I saw this on Nordstrom today too and it's such a tease! It has me a little confused. I wish Essie just come clean about their fall collecton. I just can't see them releasing four colors! Steph, I know what you mean. It's like they are keeping it under lock and key! Last year they did a really nice Fall collection and I hope they do another good one! WHY DOES BLOGGER NEVER POST MY NAME AS A HYPERLINK!?!?!?!?!?!?!?!?!?!?!!?!?! ?